What is a Georgian Conservatory? 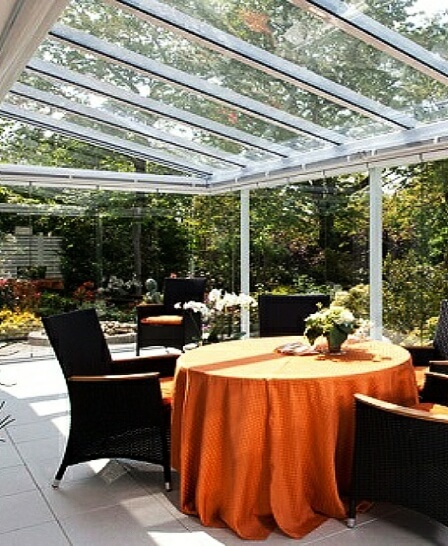 Another of the three styles often referred to as period conservatories, the other two being Victorian and Edwardian. 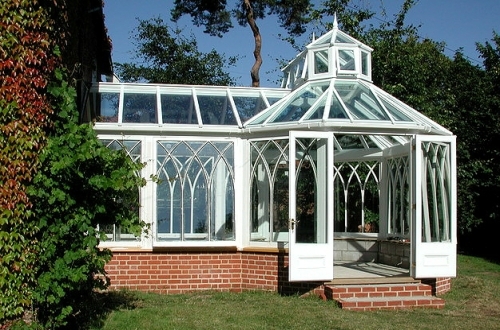 As with the other period styles, Georgian conservatories take their name from the reigning monarch of England at the time they first became popular. In this instance, that would be King George IV (4, th) and spanned just around 100 years, being the early 1700’s to early 1800’s (18th to 19th Century). Similar in many ways to the Edwardian style, Georgian conservatories are usually square or a “double-cube”. Originally, because at the time it was not usual to make big panes of glass, Georgian conservatories would feature lots of small panes. That’s probably where the term “Georgian bars” originated and describes the wooden bars or dividers used between the small glass panes. What does a Georgian Conservatory look like? Again, there are a lot of similarities between this style of conservatory and the Edwardian. Both have rectangular or square layouts with pitched 3 or 4 sided roofs. The original Georgian style would often have fancy cornices and corbelling around the top of the glazed sides, giving a reasonably ornate and decorative appearance. You may often see this design with smaller glass panels set within the main frame of the window or even using vertical sash windows in the design. This is probably the way to initially distinguish a Georgian from an Edwardian, as the Edwardian is more likely to have larger clear glazed sides to the room. Dwarf walls are also very often used in this design and you may also see thicker corner posts or pilasters used occasionally. Edwardian rooms are well proportioned and elegant, but can sometimes appear to “fussy “or “busy” for certain tastes because the smaller glass panels. 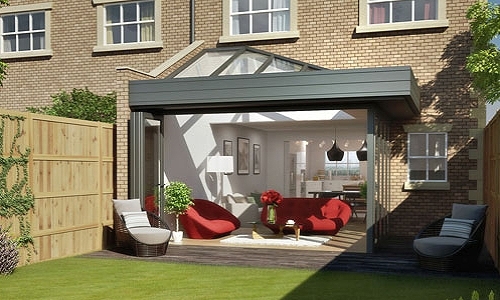 The square or “double-cube” dimensions, high pitched roof, combined with a restrained ornate manner, make the Georgian conservatory an appealing solution to the need for extra living room. It’s a personal preference as to whether the room features a 4 or 3-sided roof, but it is more likely that a 4-sided roof (almost like a lantern style) would better suit a wide conservatory. Whilst a true Georgian would feature the glazing made from smaller panes, it’s up to you whether you are inclined towards prefer that or large glass sections. With timber made rooms, choosing a colour is easy, you just have it painted it the colour that you like. If you are using uPVC as the frame material, there are about a dozen or so different options that also come in wood-grain effect surface finishes. For aluminium frames you could find powder coat colour finishes in over 100 shades including a “timber grain” finish. If you have the room, and the budget, you could create a T-shaped Georgian conservatory. In our opinion, this style looks better with a full glass roof, but that does not mean you cannot fit a solid tiled roof to a Georgian conservatory – it’s all a matter of personal choice. 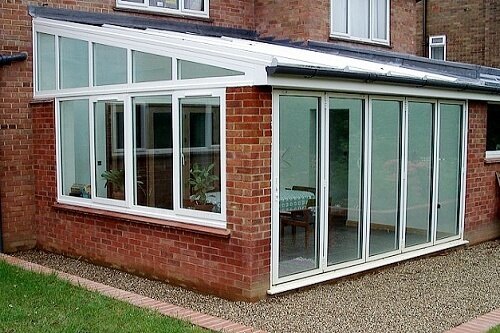 As with many other types of conservatories, the structure can be manufactured out of Aluminium, uPVC or Timber. Hardwoods are a popular option, but of late, engineered wood such as LSL (laminated strand lumber) is coming to the fore due to its stability, strength, appearance and price. uPVC Frames are a good choice. As a construction material it is light, strong, very durable and comparatively lower priced than Hardwoods. 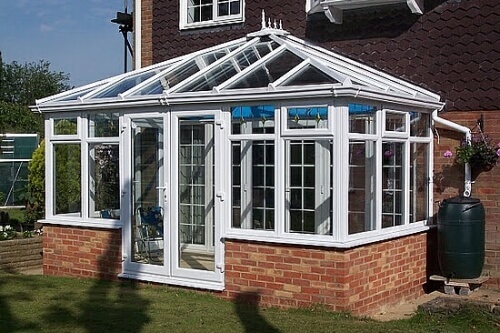 Aluminium has yet to make a big impact in the Georgian conservatory market, but it is an excellent material to use as it is as light as uPVC but stronger. This allows for thinner frames giving the ability to create a more “slimline” appearance. As mentioned briefly beforehand, there are 3-sided and 4-sided roof options for the room and within that choice you could fit either full glass or solid tiled. If you use high quality double glazing with solar controlling glass (Pilkington have an excellent range of products for this), the room will be comfortable all year long. Vents in the roof, however, are still a good idea to aid in ventilation. Self-cleaning glass is a great idea – it saves a lot of work keeping the roof in good condition. 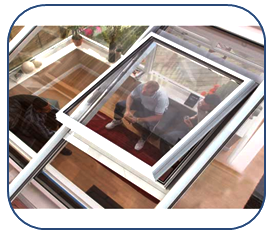 Argon gas filled double glazed units add another layer of thermal efficiency. In terms of solid roofing, in our opinion it takes away from the true Georgian style and lessens the character of the conservatory, but as usual its “horses-for-courses”. Concrete tiles – these are easy to find in multiple designs and colours. The cost of concrete tiles themselves is not prohibitive, but they are heavy. Clay Tiles – Very much the same range of designs and colours with similar properties to concrete tiles, but may cost more. Natural Slate – Lighter than concrete tile with a truly classic look. Can be expensive though. Synthetic tiles & slates – these are roof coverings made from materials such as recycled plastic, cement and limestone. Their primary features are light weight, colour range and durability. 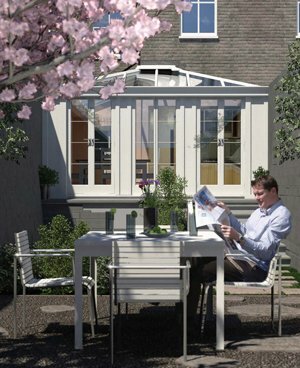 What material should I use to build a Georgian Conservatory? It’s the framework of the conservatory which provides the overall look of the room, and so the type of material used will definitely have a major influence. 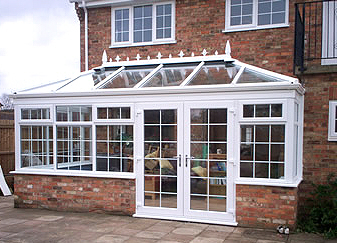 UPVC – Primarily produced in white, uPVC is renowned for being easy to look after, strong and lightweight. No painting needed, and you can get it in different colours & finishes. Wood / Timber – not only do you have hardwood and softwood products; you also now have the option to use engineered wood. 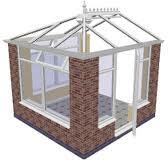 Hardwood conservatories can be costlier than uPVC versions. Aluminium – Although not the most popular choice for a Georgian room, it is a very lightweight product that has great structural strength. The colour choice is huge (over 100 colours).. Bearing in mind that your particular project is unlikely to be the same as anyone else’s and that actual prices are always based on the design being installed, it is difficult to be accurate about costings. But as a general (very rough) a rough guide, you could expect Georgian Conservatory Prices for a 3.5 m (11.4 feet) wide x 3.5 (11.4 feet) deep, full glass room from £9,500 to £10,500. This is a similar cost to that of an Edwardian style, as the designs are very close in appearance. In the case of a larger example of 4m x 4m (13ft x 13ft) you would notice an increase in price to be in the region of £13,000 to £15,000+ (again similar to Edwardian prices). 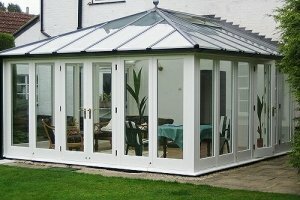 What is the difference between Georgian & Edwardian Conservatories? They are very similar, both in terms of shapes (square / rectangular) and roof style (apex roof). The major difference between the 2 would likely be in the glazing as true Georgian conservatories feature smaller glazed panes in the window frames. Always check with your local planning office before building, but if you don’t build a really large one, you may not need planning permission. Can I get a pre-fabricated base? There are options for pre-fabricated galvanised steel bases on the market that can be used with this type of conservatory. How do I know if the installer is reputable? We are of the opinion, that if an installer does not go to the time & trouble of getting themselves accredited by a proper trade body such as FENSA. CERTASS or DGCOS (or equivalent), then they may not be that bothered about their trade reputation. We would say only use a registered contractor.